Team and Speaker award winners beam with pride following their victories! This House would eliminate life without the possibility of parole sentences for all adults. The proposition prevailed in 55% of the rounds. 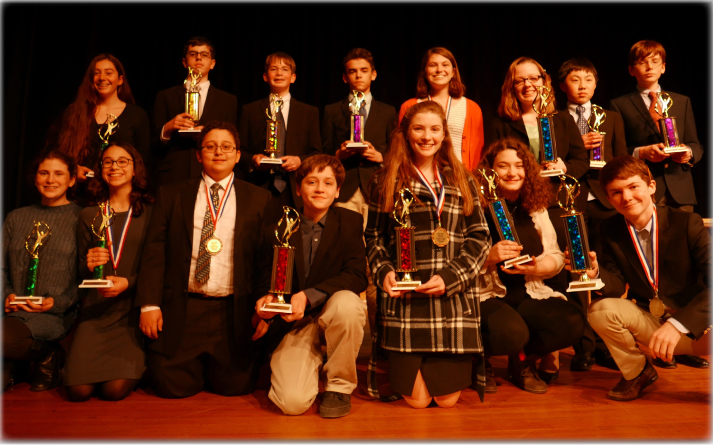 The team of Concordia Zito, Laney Goral and Aiden Gilles from the CREC Greater Hartford Academy of the Arts repeated their December performance, winning the final round on Opposition. A warm thank you to: Middlebrook coaches Michael Panoli and Michael Wallace and the Wilton High School debaters and parents who helped out and judged; the English Speaking Union, Greenwich Branch, for sponsoring us and their vice president, Robert Whitby, for judging; our amazing judges including 18 high school and college students; and, all of the coaches and parents whose hard work and support allow middle schoolers in Connecticut to debate competitively! The next tournament will be held on Saturday, April 22, 2017 at Eastern Middle School in Riverside, Greenwich, CT. The motion will be released by the end of February. Visit the CTMSDL website for more information.